I recently finished up shooting a side project DVD on Humpback Whale Photography… watching them and photographing them (facebook: Exploring Maui). A little different from my usual gig of wrangling Photoshop plugins! ;-) For the most part it was shot with a Canon 5D Mark II. The 5D is great when it’s locked down on a tripod and you’re shooting interviews or talking about a topic. The DVD has a lot of amazing photos of the Humpbacks, but very little actual video. This is due to the fact that the 5D doesn’t work well for wildlife videography. Now, some of you might have expected that, knowing about rolling shutter, aliasing, and some of the other issues that DSLRs have. However, when I started the project, I was blissfully unaware of most of those issues. Even though we shot with the 5D on a Stedicam Merlin most of the footage was unusable. Between the motion of the boat, the rolling shutter, and fast moving wildlife the 5D proved not to be the camera we hoped it was. (it was everything we expected for the tripod shots, so that came out well. But when we were actually on the boat… not so much.) There are some Final Cut Pro plugins to help out with these problems, but when dealing with a boat and wildlife it was just too much for the camera. 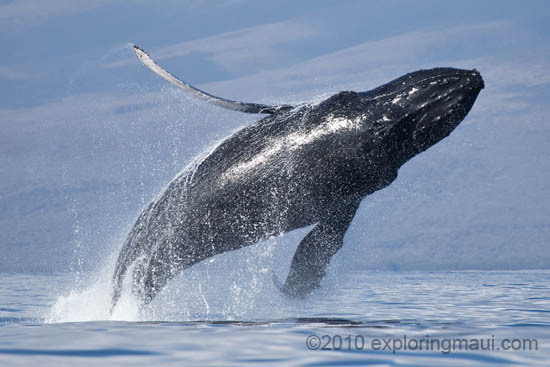 So the DVD was made with a little video footage of the whales and a lot of great photos. It came out fine, but looking to the future we want to shoot videos of the whales. What to do?